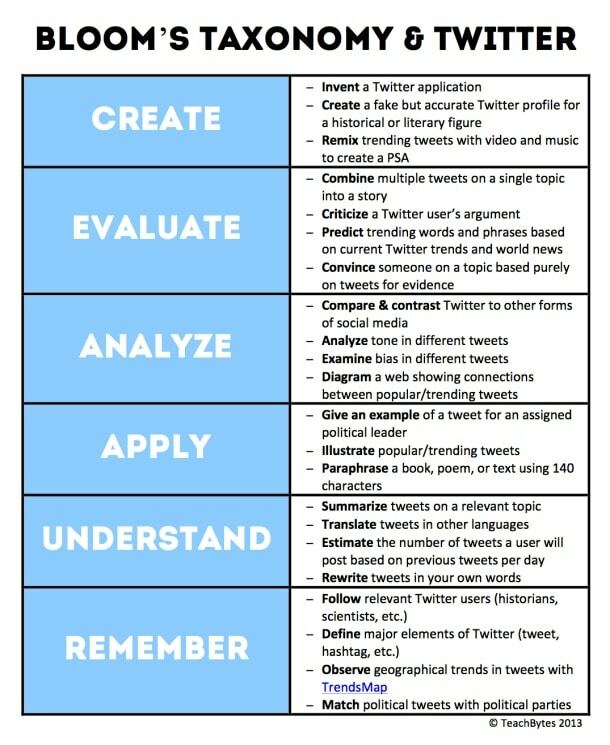 Last year we created a “twitter spectrum,” an image that clarified different ways that twitter could be used in the classroom in (hopefully) authentic ways. TeachBytes has followed that up with an excellent graphic of their own that uses a pure Bloom’s Taxonomy approach. The specific ideas range from “remix trending tweets with video and music” to creating concept maps showing the relationship between tweets. We must admit to going back and forth over the exact fit of a social media platform like twitter in a formal (or informal) learning environment. Clearly it’s a great way to skim and monitor information streams, but just like we wouldn’t use sing Shakespearean sonnets to toddlers at birthday parties, using twitter as an in-depth critical thinking tool requires a bit of squinting, even as an Avante-garde 21st century learning tool. Unless you’re using it as a cultural survey of sorts. Or study media design. Or following experts. Then it works swimmingly. As with all things, sweet spot matters. To help you find it, this graphic should help.